What if we said you could have a truck with best-in-class gas 410 horsepower? Or best-in-class diesel? Or what if we said it had a payload of up to 4,050 pounds. Look no further than the all-new 2019 RAM 2500! CAPABILITY: The 2019 Ram 2500 is perfect for getting the job done! It has a towing capacity of 19,780 lbs and a payload of up to 4,050 lbs. With the class exclusive WARN ZEON-12 Winch, which is the only factory installed winch on a heavy duty truck, you can retain it’s 12,000 lb rating. 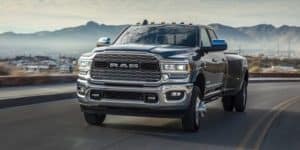 The 2019 Ram 2500 now has re-engineered frame that incorporates 98.5 percent high strength steel, and for the first time ever, a light weight aluminum, which reduces frame weight by 40 pounds. Not only does the 2019 RAM 2500 possess the power you need, but it comes with a plethora of technology to help you complete the job as well. A 360 degree surround view camera and Trailer Reverse Guide View just add to the superiority of the 2019 RAM 2500. INTERIOR: The 2019 Ram 2500 might look rugged on the outside but the inside makes your drive luxurious. Now the 2019 Ram 2500 Limited features more leather seating and actual real wood coverage than the Ford F 250 or GMC Sierra Denali 2500. On the flip side, the 2019 Ram 2500 Power Wagon offers a black and liquid graphite trim for a more rugged feel. The center console allows you ample space to store nearly anything. EXTERIOR: You don’t have to worry about making a statement in the 2019 Ram 2500 – this truck does that on its own! Optional LED tail lamps help modernize the truck a bit but give you the visibility you need, while the RAMBOX Cargo management system makes it easy to store your tools on the outside of the truck. Another feature that makes this truck super functional is the power release tailgate. With just a push of a button you can now open/close your tailgate. I don’t think we need to say anything else than this is the truck for YOU. 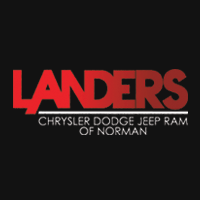 Come in and see us today at Landers Chrysler Dodge Jeep Ram of Norman.